� In Fortaleza, Brazil in 2016, Dowdy and Emily Stockman placed fifth after defeating four top-10 teams, including top-seeded Agatha Bednarczuk and Barbara Seixas, who later that summer went on to win a Silver medal in the 2016 Rio Olympics. 2018: Dowdy and Pollock played four AVP tournaments together, getting a best of third. Dowdy ended the year ranked eighth in hitting percentage (.466). Dowdy and Pollock played 10 FIVB tournaments, winning a one-star event and also getting a bronze. 2017: Dowdy formed a partnership with Irene Pollock, getting a best of third in their six AVP tournaments together. 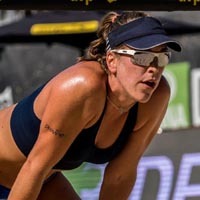 On the FIVB Tour Dowdy and Whitney Pavlik played once, finishing ninth, then she played four times with Pollock, placing fifth in one-star events twice. 2016: Dowdy and Emily Stockman played in four AVP events together, with a best of third in their first event together. She then played twice with Whitney Pavlik with a best of seventh. Dowdy was sixth in blocks (.80 per set). On the FIVB Tour Dowdy finished ninth with Heather McGuire in their one event together. She played three international events with Emily Stockman with a best of fifth in Brazil. 2015: Dowdy played six AVP events, once with Nicole Branagh and five times with Heather McGuire. She had a best of third in Chicago after defeating the teams seeded first and fourth. Dowdy ended the year ranked seventh in blocks (1.02 per set) and eighth in kills (6.55 per set). On the FIVB Tour Dowdy played twice with Kendra VanZwieten and four times with McGuire, advancing once to the main draw. 2014: Dowdy played one AVP qualifier with Stubinski, then played five times with Nicole Branagh, finishing fifth three times. She also played once on the AVP Tour with Branagan Fuller, finishing fifth. Dowdy also played three times on the FIVB Tour with Sarah Day with a best of 17th twice. 2013: Dowdy played one AVP qualifier with Jessica Stubinski in addition to playing four other domestic events with a best of third. 2012: Dowdy played two domestic events with a best of seventh. College: Dowdy was a four-year starter at Texas Tech. She was selected the 2008 All-Big 12 Freshman of the Year and earned First-Team All-Big 12 honors in both 2010 and 2011. In 2010 she set the school record for most kills in a match with 37 against Colorado. She left as the all-time kill leader for the Red Raiders. Personal: Following college she played professionally indoors for the Bundesliga in Germany in 2011-12, then played professionally in Puerto Rico in 2013. She began playing beach volleyball in 2012 to stay in shape for indoors, but in the summer of 2013 decided to only pursue beach volleyball. She was chosen for the 2013 U26 USA Elite Eight team, then became a member of the 2014 USA Elite Development Program.